What Burns Fat Faster: Low-Impact Cardio or High Impact? Aerobics class is a fun way to get your cardio workout and burn fat. When you're on a mission to reduce your body fat, you don't want to waste time doing exercise that won't get the job done. You may have heard conflicting views on whether high- or low-impact exercise burns more fat. It turns out that while both high-impact and low-impact cardio will tap into your fat stores, combining the two may be your best bet. Throughout the day, you burn both fat and carbohydrate to fuel your daily activities. During long-duration rhythmic exercise at low to moderate intensity, you recruit more of your energy from fat. But before you put the brakes on your high-intensity workout, consider that you burn more energy overall at higher intensities. According to exercise scientist Len Kravitz, PhD, even though the percent of energy derived from fat decreases at high intensities, the total amount of fat burned actually increases. What's more, your basal metabolism remains elevated for a longer time after high-intensity exercise, meaning you continue to burn more calories post-workout. Your current fitness level also plays a role in fat recruitment. 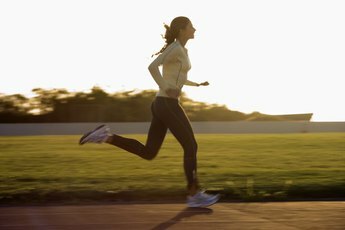 A 2000 study published in "Metabolism" found that trained endurance athletes burned energy more efficiently and at a higher rate than an untrained control group. At high intensities, the trained group recruited more fat from both adipose tissue and intramuscular fat stores. In other words, the more you work out and the more fit you become, the more efficient you'll be at recruiting fat for fuel. Gender may also play a role. According to Dr. Kravitz, women tend to rely more on fat for fuel at all intensities, sparing carbohydrate stores. Depending on your mode of exercise, the intensity of your cardio workout is determined by a combination of factors including speed, power, incline and large-muscle movement. 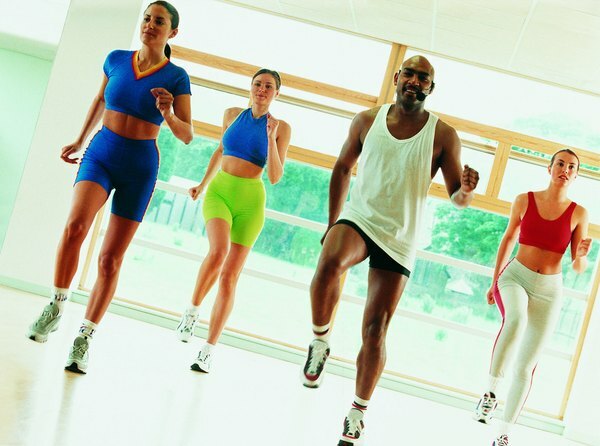 During an aerobics class, whether high or low impact, your intensity level can vary greatly. While speed is dictated by the tempo of the music, intensity depends upon the range of motion through which you move the joints in both your upper and lower body. Larger movements require more energy, and will result in a greater caloric burn. Fully extending and flexing the joints in your upper body and taking larger steps with greater hip, knee and ankle flexion will make your heart pump harder and recruit more energy. To increase your fitness level and speed up fat loss, high-intensity interval training, or HIIT, may be your best bet. HIIT combines bouts of low-to-moderate intensity exercise with high-intensity bouts at all-out effort. For example, intersperse brisk walking for two minutes with one minute of full-out sprinting. Repeat the cycle 10 to 20 times. As your fitness improves, increase the duration of the high-intensity bouts. 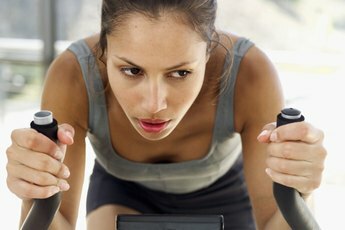 A 2008 study of untrained individuals published in "Applied Physiology, Nutrition and Metabolism" found that a six-week program of HIIT performed three hours per week resulted in improved maximal oxygen uptake, improved mitochondrial enzymes and an enhanced ability to recruit fat for fuel.